For many of us, the first thing that comes to mind when we think about Swiss design are the quintessential Swiss knives and Swiss watches. They’re iconic, and for good reason. 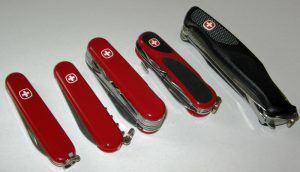 The original Swiss army knife was manufactured by the two Swiss companies Victrinox AG and Wenger SA. Today you can find copies and adaptations from a wide range of manufacturers, but Victorinox AG is still the only company to produce the tried and tested original. The knives typically have very sharp blades, and in addition have a variety of tools connected in the same handle. As the knives were meant for use by military troops, the tools are naturally of the kind that might be useful to a soldier and include, among other things, can openers and screwdrivers. The knife’s handle is normally red, emblazoned with the white cross of Switzerland. The simplistic design as well as the versatility of its uses has led to a worldwide recognition and popularity. Today you can get a variety of different style knives, from the traditional red to carved wooden handles. There is also a choice of a wide range of tool sets for different knives. The Swiss watch industry has been the cream of the crop for more than four centuries, leading the field in advanced technology, innovation and not to mention tradition. The Swiss industry was responsible for a series of firsts, among them the first wristwatch and the first quartz watch. Swiss watchmaking tradition goes all the way back to the 16th century, and was born from an attempt by goldsmiths and jewellers to develop a new art form. The world’s very first Watchmakers Guild was established in Geneva in 1601, and it has since kept its reputation as being home to some of the best watchmakers in the world. Watches really only gained wide popularity in the 20th century, which also marked the start of mass production. After World War I the wristwatch was introduced, and by the 1960s the traditional round shape that is now so familiar was properly established. Today of course, you will find watches of every design you might desire, and for the most luxurious, the most technologically advanced and the highest quality you would still do well to look at the Swiss brands.